A couple years ago two of my buddies (Rich and Milana) came up with one SIMPLE idea. They kept it simple, didn’t get distracted, and they quickly turned it into over $1.4 MILLION in income. Wow, they kind of blow my mind because they really don’t do any of that hypey, B.S.ie stuff other marketers do. FREE Report – Download it Here . This detailed report reveals their exact steps, and in turn shows how you can turn your expertise into a 6- or even 7-figure business. Plus you’ll learn why only one in eight coaches is able to create a profitable business, while others struggle to cover even basic living expenses. The cool part is the formula they reveal allows you to really work on some nitty gritty questions that will help you clarify what you do in a new way. And you’ll get an inside peek into what makes an online business truly successful. 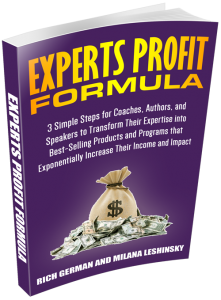 I’m reading the report right now and I think it rocks … I love Rich and Milana and think they’re geniuses at helping coaches, authors and speakers create programs that their partners want to promote, thus exponentially growing their tribe online.